Hi, I am Di Robinson, I am 53 and I am a Painter & Decorator and signwriter. Over the years, I have completed a number of courses in the hope of finding a career path that I would find satisfying. Such as Office Administration, Financial Services, Hospitality, Retail, Children’s wear (sewing). 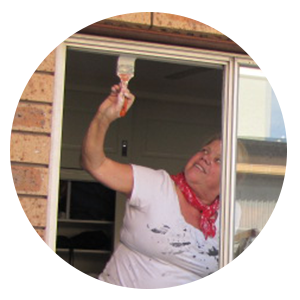 I came across the 18 week, Work Opportunities for Women course in Painting & Decorating. 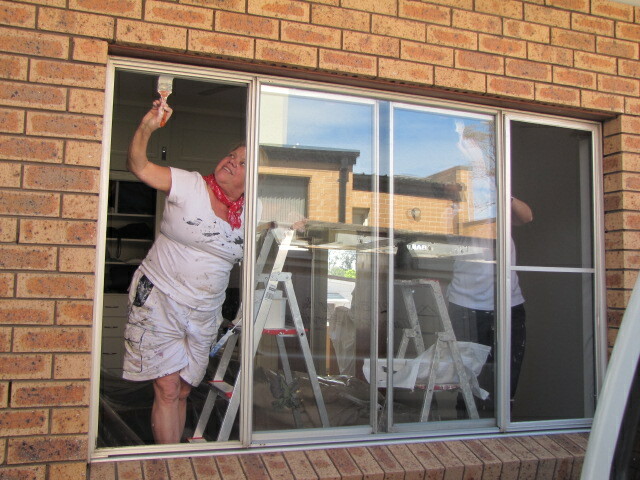 I enjoyed this introduction to Painting & decorating immensely and decided to enroll in the Trade course. I felt I’d found what I’d been looking for all these past years. I have since completed related courses in, murals, interior design, sign writing & wallpapering. I faced many challenges with time management, raising my family and my lack of confidence. I overcame them with the support of my husband and family and knowing that I’d finally found my niche in life. I love what I do. I love what paint can do for a room or a piece of furniture. I love turning something drab into something fresh & beautiful. I find it very satisfying. Gaining my Contractors license, registering my own business with a fellow tradie & friend & winning a NAWIC award have all only been made possible by completing the trade course. Completing the Signcraft Trade course was a massive achievement for me as I had started this course on finishing school in 1979. I dropped out after a few months. In my spare time, (when I get it) I enjoy time spent with family, (I’m a proud grandma), reading, photography, camping and of course painting! I am always painting something.